Litware has a deployment of Microsoft System Center 2012 R2 Configuration Manager. On the production network in the Montreal office, Configuration Manager agents are installed on the client computers that run Windows 8.1 Enterprise. Configuration Manager is used only to deploy Windows updates. Operating systems are deployed either manually or by using Windows Deployment Services (WDS). Configuration Manager servers and WDS servers have the Microsoft Deployment Toolkit (MDT) 2013 installed Configuration Manager and MDT are integrated. The network contains servers that run Windows Server 2012 R2. The network contains the client computers configured as shown in the following table. – IT administrators report that operating system deployment and license tracking of Windows 8.1 Enterprise are too labor intensive. – Certain internally developed applications have compatibility issues with Windows 8.1 Enterprise. – On the production network, implement a Key Management Service (KMS). – Deploy a Configuration Manager agent to all of the production network computers. – On the production network, implement a Zero Touch deployment of Windows 8.1 Enterprise. – On the production network, deploy Windows 8.1 Enterprise to all of the client computers that run Windows 7 Enterprise. – On the development network, implement a Lite Touch deployment of Windows 7 Enterprise and Windows 8.1 Enterprise. – Images deployed by using Configuration Manager and WDS must include Windows updates that are deployed already to the client computers. – The installation of Microsoft Office 2013 on the production and development networks must include Outlook, Word, and Excel only. – The deployed operating system must take full advantage of the hardware platform to which it is deployed. – Network traffic to the Internet and WAN traffic between the offices must be minimized, whenever possible. – Operating system deployments must include the latest Windows updates. – All SQL Server instances must be Standard edition or Enterprise edition. – Images copied between distribution points must NOT use any network bandwidth. – The Microsoft Assessment and Planning (MAP) Toolkit must be used for all assessments of the client computers. – Operating system deployments to the production network computers must use Configuration Manager integrated with MDT. – Office 2013 must be deployed to the production network computers by using Microsoft Application Visualization (App-V). – Server1 and Server101 must be used for operating system deployments and Windows update deployments to the production network computers. – All Configuration Manager operating system deployment task sequences must be capable of using the settings configured in Customsettings.ini. – The capture of reference images on the Configuration Manager servers must be implemented by using the build and capture a reference operating system image task sequence. – When reinstalling computers on the development network, the user state of the administrator account and the local accounts must not be captured. The user state of all other accounts must be captured. – Application compatibility issues of internally developed applications must be identified by monitoring the execution of each application on the Windows 8.1 Enterprise computers. – Server201 and Server301 must be used for operating system deployments to the development network computers by using WDS integrated with MDT. – All new systems on the development network must run Windows 7 Enterprise x86/x64 or Windows 8.1 Enterprise x86/x64. – Office 2013 must be deployed to the development network by using Windows Installer (MSI) package-based installations. – All computers deployed to the development network must be periodically reinstalled. You need to recommend a procedure to identify the compatibility issues of the internally developed applications. Which three actions should you recommend be performed in sequence? To answer, move the appropriate actions from the list of actions to the answer area and arrange them in the correct order. You need to prepare Server2 to perform a Windows 8.1 readiness assessment of the production network computers. Which three actions should you perform in sequence? To answer, move the appropriate actions from the list of actions to the answer area and arrange them in the correct order. You need to identify which licensing keys must be used for the client computers. Which licensing keys should you identify for each network? To answer, select the appropriate licensing key for each network in the answer area. B. Set Task Sequence Variable. You need to recommend a procedure for capturing a reference image from the production network. Which three objects should you recommend be created in sequence? To answer, move the appropriate objects from the list of objects to the answer area and arrange them in the correct order. 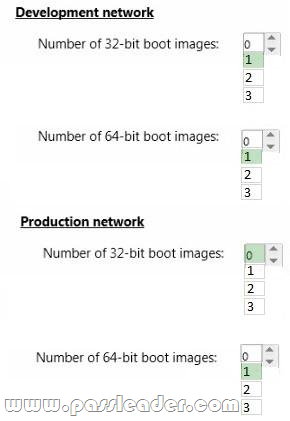 You need to identity the minimum number of boot images required for the operating system deployment to the production and development networks. How many images should you identify? 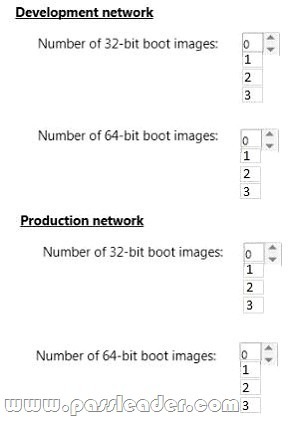 To answer, select the appropriate number of images for each boot image type in the answer area. You need to identify which executable and which parameter must be used to meet the technical requirements for the development network. Which executable and parameter should you identify? 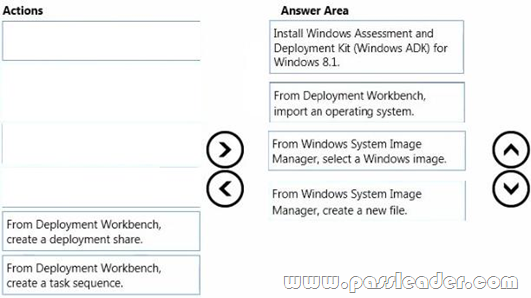 To answer, select the appropriate executable and parameter in the answer area. You need to configure an unattended file for operating system deployments from Server201 and Server301. Which four actions should you perform in sequence? To answer, move the appropriate actions from the list of actions to the answer area and arrange them in the correct order. A. Add an operating system image. B. Run the Create Automatic Deployment Rule Wizard. C. Add an operating system installer. D. Run the Create Task Sequence Wizard. E. Run the Schedule Updates Wizard. You need to identify which actions must be performed to distribute the boot images from Server1 to Server101, once Server101 is configured as a distribution point. What should you identify? To answer, select the appropriate server to perform each action in the answer area. You need to recommend a procedure for configuring the deployment of Office 2013 on the production network. Which four actions should you recommend be performed in sequence? To answer, move the appropriate actions from the list of actions to the answer area and arrange them in the correct order. You need to prepare Server1 and Server101 for an operating system deployment. What should you configure on each server? To answer, drag the appropriate actions to the correct servers. Each action may be used once, more than once, or not at all. You may need to drag the split bar between panes or scroll to view content. Download the newest PassLeader 70-695 dumps from passleader.com now! 100% Pass Guarantee!